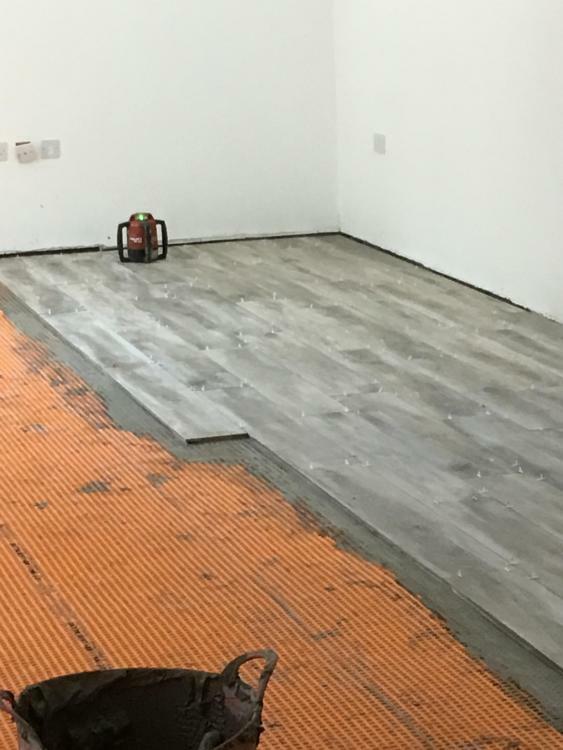 @nodWhat us the orange stuff under the adhesive, looks like a great job and you are a brave man taking that amount of tilling on or are you a closet pro! What the benefit of the decoupling mat? Limits or elimates chance of cracked tiles due to floor movement. About £10/m2. I started our tiling last night - lot less progress than that though! 25m2 - bugger, I need to get a shift on, 1/10th of thats about my daily target! Backs buttered as well? Just buy large format tiles and you soon cover some area. That's interesting, our UFH is in the slab and as we now intend to Tile, as the power float polish failed, do we need it?As things stand I was intending to tile directly to the slab after the failed polish is scabbled off. I thought that's what flexible adhesive was for on a concrete floor. Isn't decoupling mat a must if your tiling say a ply topped floor? 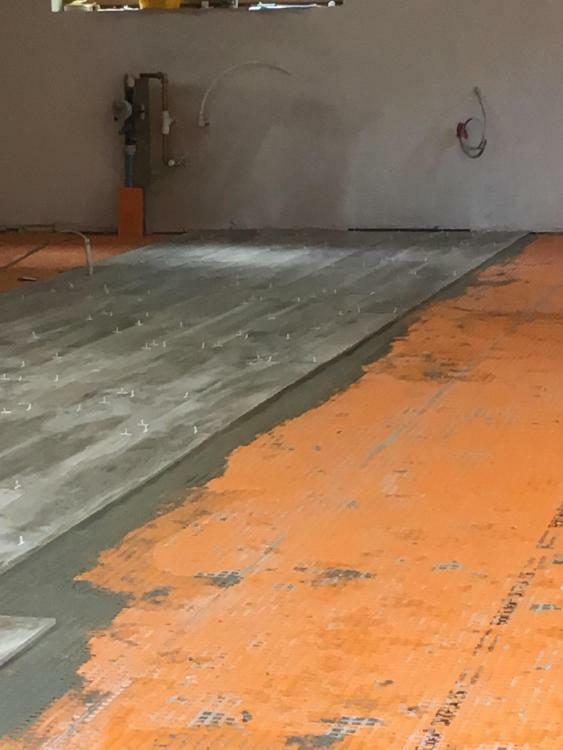 The matting isn't needed at all for a modern, low temperature, UFH system with tiles laid on to a slab with embedded UFH pipes, as there will be zero relative movement from any temperature differential. The use of this matting harks back to the old days when poorly insulated houses needed UFH running at over 30 deg C in order to give enough heat output, so there was a significant temperature differential through the floor. No new build today, even one just built to meet building regs, is going to need UFH anywhere near that hot. The floor will get much hotter from the sun shining on it in summer than it ever will from the UFH. For example, it used to be that UFH installers would work on the basis of being able to get around 50 to 60 W/m² of heat from a UFH installation, sometimes more, maybe up to 80 W/m². That equates to a floor surface temperature of around 26 to 28 deg C for a 21 deg C room temperature, and a UFH flow temperature of around 30 to 35 deg C or so. No new build today is going to need that much heat, our house, for example, needs at the very most a floor surface temperature of less than 23 deg C, and there's no way whatsoever that 23 deg C is going to cause the slightest problem with relative movement - that's only 2 deg C warmer than the room. We never need a flow temperature that's higher than about 25 deg C, and that's only in the very coldest weather. I've measured floor surface temperatures of over 30 deg C in sunny areas in our old house, which doesn't have UFH, but does have tiles laid directly on a concrete slab and they've not cracked or moved in over 40 years. 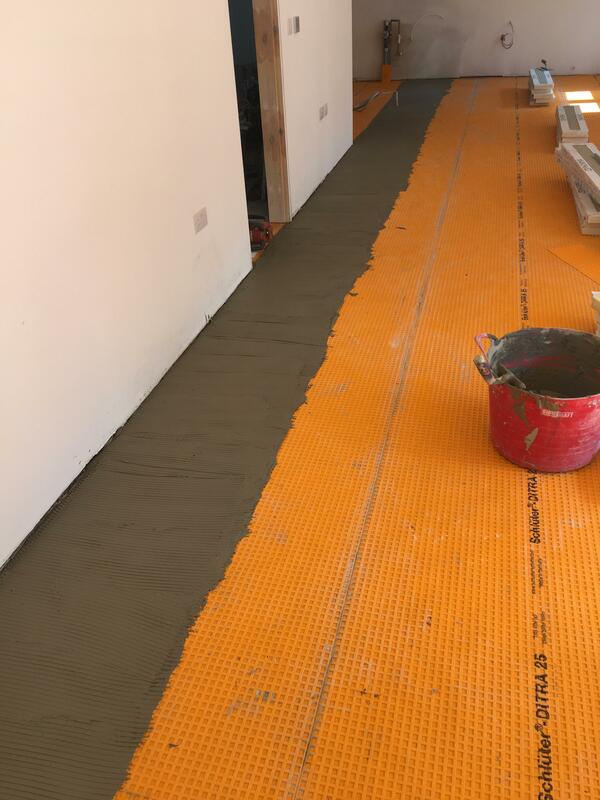 I have an anhydrite screed over UFH so the matting was recommended due to the screed type more than the UFH. If our reinforced concrete slab moves we're in BIG trouble, least of all will be the travertine laid directly on it! It's a question of horses for courses here. The low temperature differential, plus the reinforced slab, means there is zero risk of relative movement. A non-reinforced, non-structural screed may possibly move a bit. Both the two posters above and our own house have a reinforced concrete slab that isn't going to move at all relative to stone or tile flooring, but the same may well not be true for those using a screed that's non-structural. Older concrete and screed floors like @Onoffwill have finished with any shrinkage movement so anything you put on top should be okay if there’s no existing cracks. There's the answer chaps, wait three years before tiling! Is that big sheds (b&q, costco etc) just not a thin screed aswell? Yes, 2 years is long enough even with a power floated slab. All I can say is that it's not the case at all for our slab - no movement at all, not even a fraction of a mm, in the five years since it was cast. @Onoffs concrete was down a couple of years or so before being tiled, IIRC, and is also reinforced. Our old house had the slab tiled not long after it was built in 1986 and there's been no movement there, either, and that's not even a reinforced concrete slab, and the area by the front door get's very hot from sun coming in through the glazed panels. I can understand the problem with large areas in a warehouse, particularly given that they probably tile those places out before the slab has even had time to properly cure, but remain wholly unconvinced that the significant extra expense of decoupling mat is warranted on reinforced concrete slab that's pretty well cured before it's tiled. No, they are all power floated concrete slabs reinforced with steel mesh. Remember the wet room corner has only just been done this year, with my home brew, SBR laden mix!